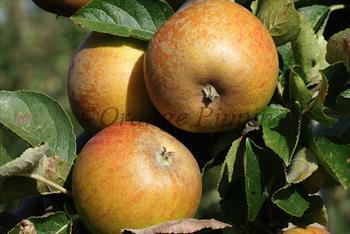 Ashmeads Kernel is a very old traditional English russet apple. It remains popular for its distinctive pear-like flavour which is quite different from most other apple varieties. Although often considered as a connoisseur's dessert apple, Ashmead's Kernel is actually quite versatile. It can be used for cooking, or sliced in savoury salads, and it keeps very well in a cold store. Ashmead's Kernel is also becoming increasingly recognised for its juice, which adds an interesting fruity component to cider blends. Please fill in the details below and we will let you know when Ashmead's Kernel apple trees are back in stock. The classic English russet apple, slightly sweeter flavour than Ashmeads Kernel. Ashmead's Kernel is in flowering group 4. Ashmead's Kernel is a triploid variety and cannot pollinate other varieties. It needs to be pollinated by another tree of a different variety nearby. You can either plant a self-fertile variety (which will pollinate itself and the Ashmead's Kernel) or you can plant two pollination partners which must each be of different varieties and able to cross-pollinate each other as well as the Ashmead's Kernel. If you need further advice on this just get in touch. Ashmead's Kernel is quite easy to grow, and perhaps because it is such an ancient variety, it is relatively disease resistant. It can be a light cropper and this usually caused by poor pollination at blossom time - planting another late-flowering apple tree or crab-apple tree nearby is a good idea. Originated in England in the 1700s, probably in Gloucestershire.